After two weeks of subbing followed by the natural dye workshop, I knew that I had some serious work to do this week if I want to have anything to sell in the last farmers markets of this season and the upcoming craft fairs -'tis the season. The worst to be behind in is soap since it requires weeks to cure. I made three batches this week, and since I only have one mold, I can only do one batch a day. 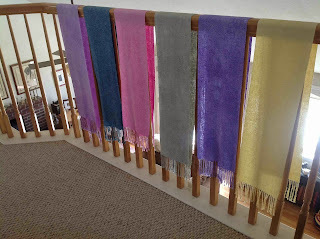 I also finished weaving the four undyed rayon/silk scarves. They look terrible when they come off the loom and it's hard not to discouraged - they're stiff and look like gauze bandages. They're one project that truly isn't finished until it's wet finished. They're worth it though because they finish up very nicely. The yellow and green ones are from last year so I'll have six - I'm feeling better about Sunday though I still have very little soap. The real push though was to finish the two commissioned rag rug runners. I pulled them off finally about noon today. I used every bit of the six Goodwill sheets I bought and was getting nervous that I would run out but I didn't, and that's what counts. My client wanted them for her kitchen that she said was decorated in Red Rooster. I'm not familiar with that theme but have a couple of roosters of my own that I used to direct the palette. I put one down in the hall because I don't have any place to put both of them. Her kitchen must be really big. I absolutely love them. The next order of business is to get warped for more dishtowels. I've chosen these colors and with the help of my Ruby Beholder there in the foreground, arranged them according to value. Believe it or not, that bright red has a color value very close to the yellow. It helps me avoid creating stripes and get a more random effect - I hope. My Neoworx counter emailed me this week that I had a visit from a new country - the Faroe Islands. Check it out! I'm always amazed at the global reach of the Internet and wonder how on earth (pun intended) someone from islands near Greenland found their way to the northwest corner of Nevada and me. The sky yesterday morning was astounding. I talked to Marilyn and Nancy about using rabbit brush which is currently in full bloom for a yellow in lieu of the osage orange. They are very close friends and share a ton of knowledge between them. They said that rabbit brush color depends on the time of year when you collect the dye stuff. Early on in the spring would have provided the "national geographic yellow." Now I would get a gold using alum as the mordant. At this stage it's so full of tannin that you don't need a mordant. They suggested I try a "crackle pot" which is a layer of dye stuff, a layer of wool - and repeat. Cover it with water and cook it for an hour a day, resting it in between times until I get the depth of shade I desire. Nancy said she just did a crackle pot that she stretched over a week. Good grief. I'll think about it. Our Tumbleweeds book club met this Saturday at Marsha's, who lives just north of the Stead air field, home of the Reno Air Race. I caught a couple of shots before we convened and it was hard to not run outside when I'd hear them coming directly overhead for more pictures - even when the shadow of the plane crossed the house. Finally Marsha closed all the windows so we could hear each other. We were talking about The Forest Lover by Susan Vreeland. I'm not a fan of this author and found the book unreadable but loved learning about Emily Carr, whom the book was based on, and her wonderful turn-of-the-century art work. Click for big. I took my DSLR - you can see the propellers. I wish I could have captured the sound because it's an important part of the picture. I didn't take the camera case with backup battery, and of course this is the part where the battery dies. Today was our Little Valley Market day and I made a minimal presence. I haven't had time to make anything in at least a month so was happy that I still had stuff to sell. It's rather lonely under my Easy-Up today as Mim decided to sell from the back of her truck. One of my neighbors had a frustrating day so I told her that she needs to share my space on the next market and get rid of the umbrella that the wind is so unkind to. We live in the 40th parallel and so we always have wind. I did well today. Our local market has been better to me than any craft fair I did last year. But I need to get crackin' as soon as this sub job is over. I did manage to squeeze in a little weaving time this weekend and get started on the commissioned rug. All the time from here on will be in cutting and sewing the strips. The weaving doesn't take much time at all. Her color theme is Red Rooster. I hope this is it. I decided last weekend that I needed to stop wondering if the Texsolv heddles I bought would fit my little Dorset workshop loom and find out - time to finish the job. These are the string heddles that came on the loom and they don't slide worth a darn. Melissa had put on the replacement tie-ups for the treadles when she was here and so I was finally able to pull out one harness at a time. Not only were the string heddles icky, the heddle bars were too. The loom had lived on the California coast and between the rust and nasty heddles, the loom was unusable. I called Yarn Barn of Kansas again asked to speak to a weaver. She talked me down off the ledge. I had mailed them one of the heddles and they used it to measure against the Texsolv heddle options and determined that the Ashford table loom, or the green, would work for me. Texsolv heddles are sold in a bundle of one hundred and are bound by colored twist ties to denote their size. The bundles were tight and wouldn't fit. The weaver told me how to tease out a couple from the bundle without undoing the whole bunch, because once I pulled off the string heddles, if the new ones didn't work? Picture me hyperventilating. I think the manufacturers of the loom never dreamed someone would want to change a thing. The heddle bars are screwed in tight. I had to unscrew them so I could scrub them with steel wool to remove the rust. And then the Texsolv heddles went on easy peasy. It really is a sweet little loom, though it's going to be a while before I get to take her for a spin. I accepted a two-week library sub job at a local high school which won't end until next Wednesday. I'm subbing for a library assistant in a very busy library and enjoying the heck out it. I love the challenge, the energy of the kids, and I'm also thankful that it's temporary and I get my own life back soon. I was surprised to learn that I was the only person to accept this job. The others declined because they were uncomfortable with high school kids. I think this means that I might get to do it again. Cool beans. Until later, my workshop loom lives here. I had to run several errands Tuesday before picking up our CSA box. I drove home with the air conditioner one and once again, driving along our road in second gear, Eleanor began to overheat. I had to go to town on Wednesday for the Reno Fiber Guild meeting, our first for this new year. I had made an appointment for next Tuesday to have this overheating thing checked out and we decided that in the meantime we wouldn't use the air. I had saved errands in the south end of town for this trip, but when I pulled in the credit union parking lot, the needle was pegged to the red. I called Ian and we agreed that Eleanor needed to be towed to the dealership. I love this car. I have loved this car more than any I have ever owned. While waiting inside the credit union for the tow truck, I asked about new car financing. Ian and I talked while I waited - we suddenly realized that we might have to cut our losses, given the high mileage, and start over with a new car. Meanwhile, I needed wheels. Subaru called Enterprise for me and they came, as advertised, and picked me up. I was pleased when it was time to pay. Scott at Subaru had called them and authorized their dealership rate. My rental was a Honda Civic and absolutely the most boring car I have ever driven. I left home at 1:00, pulled into the credit union at 2:00, and skipping all my errands, arrived at the library one minute early to meet with the weaving outreach committee at 5:45. The meeting started at 6:30 and I got out of there at 8:45. Long day. We had a rather protracted business meeting since it was the first one of the year, followed by an energetic exchange of Show-and-Share. It seems everyone was busy over the summer. Lorene was been a Kumihimo machine ever since our class last year and now she has begun exploring burnished wire pendants. Diana Ballard has a machine that prints fabric, I think mostly silk. I really don't understand what it is or how she does it but I know she wins awards. She and Marilyn did a series for the May Arboretum this summer and those scarves sell for $100 each. These are some of the scarves she printed recently. Nancy has been experimenting over the past several months with this 16-sharft weave structure, using up random yarns. Now you can see why I'm the newbie weaver in the guild. Beryl brought this pin loom from a class she took at CNCH. I think we're going to try to adapt some smaller ones for our outreach in March so that anyone who wants to try weaving will have something to take home. I just noticed that the scarf on the left is mine! I woke up early the next morning, after a restless sleep, knowing we were going to be facing some espensive decisions. Scott was supposed to call with an estimate on the repair expenses, but Ian had been reading stuff online and came to the conclusion that we were looking at blown head gaskets, most likely something that has been slowly developing ever since Eleanor's radiator blew up in the desert 18 months ago. We've noticed a burned smell to the engine after driving, like an overspill of coolant. If that were the case, given that we needed new struts and brakes, we decided to pull the cord. We always check Consumer Reports before making a purchase and Ian discovered that they offer a discount service, must like Costco. 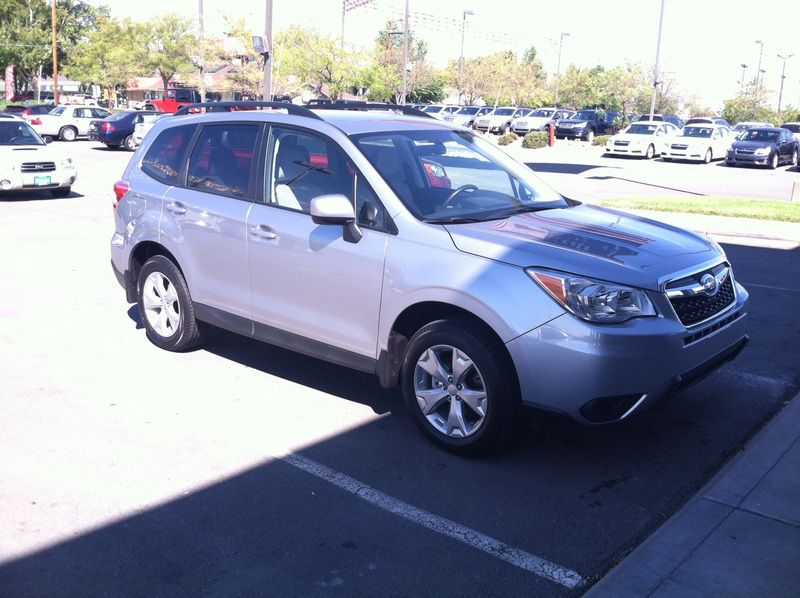 He was up early Thursday morning and locked in a negotiated price with Lithia Subaru. He had two confirmation emails from them and then a personal email from their Internet sales manager, saying he was up and to give him a call. Ian was feeding and watering, so told me to call. The guy's name was Paul and when I told him I wanted a standard transmission and a light exterior, he told me he'd have one waiting for us. And here she is. Her name is Jane, after Jane Addams of Hull House in Chicago. She was a voice for the middle class and I've always felt that the Forester is a modest vehicle. 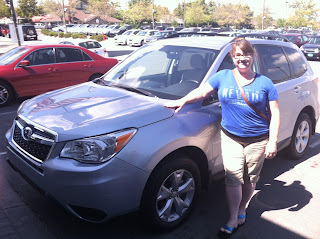 Niece Allison calls it a Commie Car, however the Forester has gotten fancy since 2006. Paul explained that the earlier Foresters were build on a Legacy chassis but the engineers designed the 2014 from the ground up. This is truly an SUV. I do miss the sports car feel that I experienced driving on our two-lane road. At the same time appreciate the solidness of the 2014 - it will be good for us out here. My phone kept pinging while we were signing our lives away. It was Christina. She said, where are you? I'm here! She had run out on her lunch hour to get an oil change, saw my post on Facebook and stopped by. And here she is with Jane - two lovely ladies. 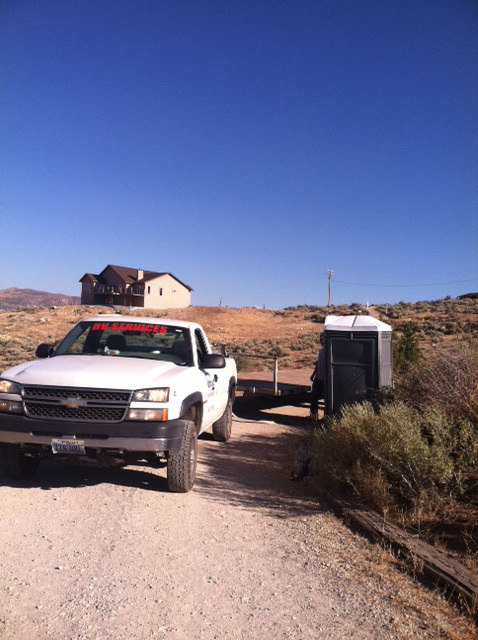 The weekend kicked off with the delivery of the Porta-Potty which was delivered while Ian was dropping Buster off at doggy camp and picking up his son Doug from the airport. This was a much smaller group than in the past couple of years but every bit as much fun. Everywhere I went, I'd come across a group of people visiting. I heard from several people that because it was more intimate, they were able to spend more time in conversation. People visited - oh my, did they. I was surprised at how popular the beanbag toss game toss was with the kids, even the teens. Most of the teens game together online, so they spent quite a bit of time in a group at the table with a laptop - and on cell phones. Cell phones were commonly in use in spite of limited cell service, thanks to our WiFi . And of course, horseshoes was huge again with the double elimination tournament on Saturday and then general play on Sunday. The winning team was my son Josh who was the defending champ, but his teammate couldn't come this year so he picked his son Logan to be his teammate this year. Ian and his friend Petey went to junior college together. They've formed a team they call Team Sep and ordered hats this year with their team name - Sep for septuagenarian. I think they make that long word look good. Giant Jenga was back and more successful than ever, thanks to the new jenga blocks that Josh made. He used kiln dried wood this time so they wouldn't warp and then sanded them smooth. 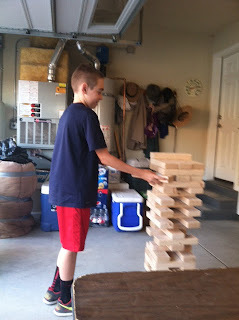 Evan and Josh played a game that went to 30 levels. 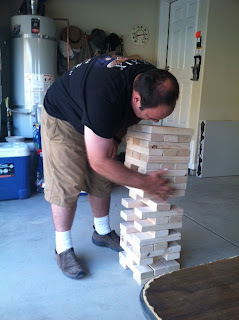 None of us ever got closer than 25, so Even is the reigning champ in Giant Jenga. It was popular with every age because anyone can play it. 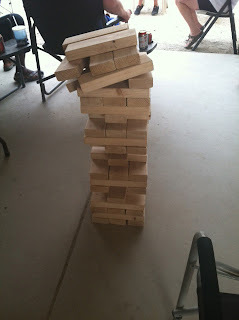 The game was a Gathering constant - set it up, challenge someone to play. Surprisingly, Giant Jenga is a spectator sport because the higher the stack gets, the more shaky it is and the more difficult it becomes to tease out that next piece. I cannot believe I pulled out the piece I did and the stack didn't collapse because it should have. Back to Kerry who by now had everyone's attention. 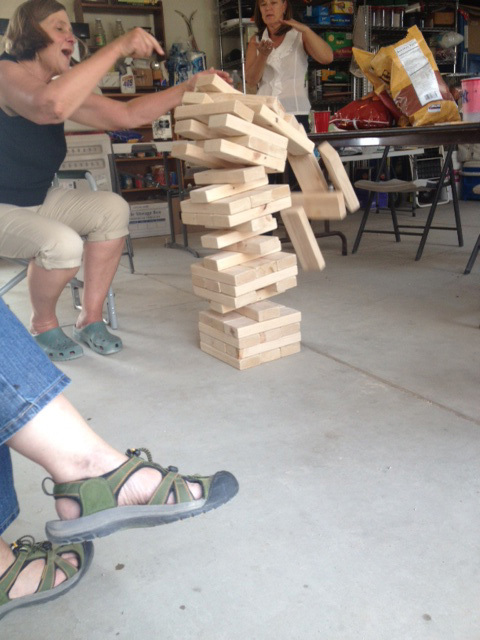 She made a play and the tension was mounting. And just like that, I reaped what I sowed. And in case you're interested in making a set, the 2 x 4 is cut into 10 1/4" lengths because that's equal to the measurement of three pieces, side by side. It needs to be square. There are a total of 51 pieces and kiln dried wood is recommended if you're going to play the game more than a few times. Otherwise, just ordinary pine will warp over time. A new tradition was emerged over the last three years. Almost everyone has left by Monday morning and that's when we clean up and neighbors come over. We sit in a circle in the garage and just chat. That's something we've lost somehow, with all our obligations and schedules and social networking - the ability and willingness to converse without being in a hurry to go somewhere. Actually, one of the activities was swatting flies which are always obnoxious and we were quite entertained. Notice now Sammie had made herself the center of attention. I spent the morning downloading pictures, labeling them and then uploading them to Flickr. If you care to see more, they are here. Meanwhile, there is a rental car in my garage but since I've just been playing catch-up, I'll save that for my next post.